China's defence scientists have built the world's fastest supercomputer, capable of performing 33.86 quadrillion operations per second, surpassing the US Titan supercomputer, according to survey results announced on Monday. The Tianhe-2 has a peak performance speed of 54.9 quadrillion operations per second, according to the National University of Defence Technology, which built the computer. 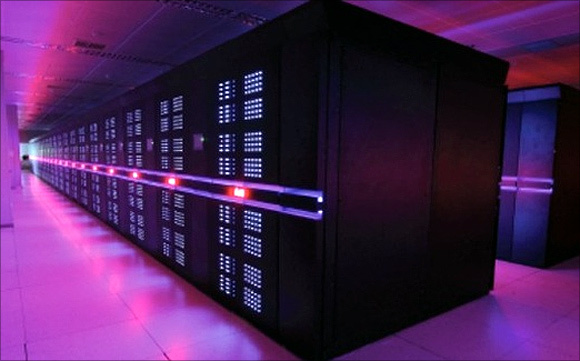 The computer's predecessor, the Tianhe-1A, was the world's fastest supercomputer from November 2010 to June 2011, when it was surpassed by Japan's K computer, state-run Xinhua News agency reported. Tianhe-2, or Milky Way-2, will be deployed at the NationalSupercomputerCenter in Guangzho, China, by the end of the year, according to TOP500, a project ranking the 500 most powerful computer systems in the world. The surprise appearance of Tianhe-2, two years ahead of the expected deployment, marks China's first return to the No 1 position since November 2010, when Tianhe-1A was the top system. The supercomputer Tianhe-2 is capable of operating as fast as 33.86 petaflops per second. It was ranked today as the world's fastest computing system, according to TOP500. Titan, a Cray XK7 system installed at the US Department of Energy's (DOE) Oak Ridge National Laboratory and previously the No 1 system, is now ranked No 2. According to TOP500 Editor Jack Dongarra, who toured the Tianhe-2 development facility in May, the system is noteworthy in a number of aspects. "Most of the features of the system were developed in China, and they are only using Intel for the main compute part. That is, the interconnect, operating system, front-end processors and software are mainly Chinese," Dongarra said in a statement.